THE world's best jockey is jetting in for The Everest to ride the $13 million race's first international horse. And the owner of the $600,000 slot that they are racing from has predicted that this is just the start of the international attention the richest race on turf in the world will attract in the future. 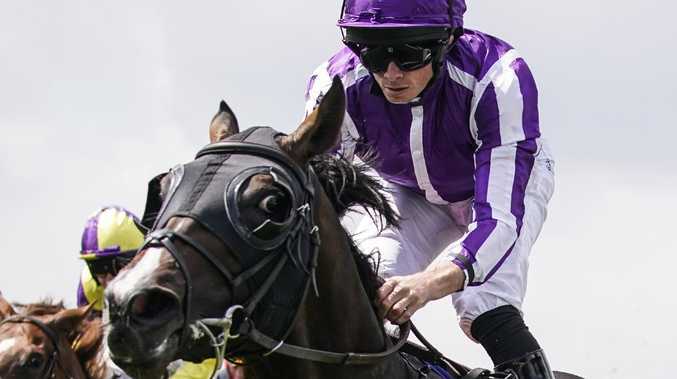 Ryan Moore is sitting at the top of the Longines World Best Jockey rankings and is known as The Flying Englishman for flying in for races, sometimes in different countries, on the same day. Moore will be riding Irish sprinter US Navy Flag in The Everest and has ditched the $1m Dewhurst Stakes in Newmarket to be in Sydney for Australia's richest race. Slotholder Tom Magnier from Coolmore Stud, who also own US Navy Flag, said: "Ryan Moore is retained by Coolmore as our No.1 jockey and he has the pick of the races he wants to attend. "There is the Dewhurst, one of the biggest races in the UK, but he is coming down for the Everest and is very excited about it. "That says something when the top jockey in the world wants to be here." Irish horse US Navy Flag (right) will represent Coolmore in the $13 million TAB Everest at Royal Randwick this Saturday. But Moore will not be here for long. 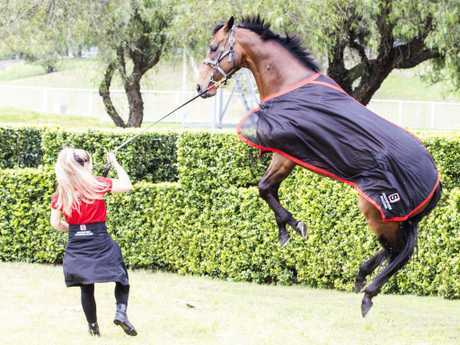 Last month the English St Leger winner had a helicopter standing by and ran from the course so that he could ride in races in the United Kingdom and Ireland on the same day. He has form for that, jetting in for the winning ride on Adelaide in the 2014 Cox Plate. And over three days in 2009, he rode a winner in Sandown in the UK, flew to Sha Tin in Hong Kong to ride the next day and was back on the track in Windsor in the UK the day after. Magnier said having the world's top jockey flying in for The Everest confirmed the reputation the race had already earned internationally. It was all people wanted to talk to him about at horse sales in Kentucky and Europe. "It is one of the most talked-about races around," Magnier said. "There is a buzz surrounding this race that I haven't seen before. 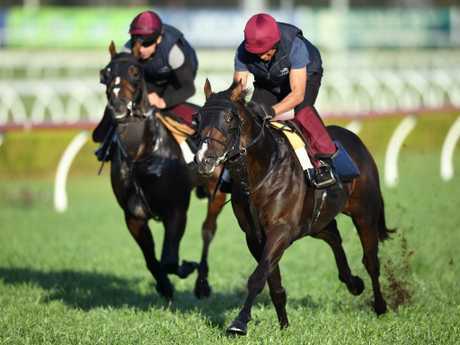 "You have got your Melbourne Cup, your Arc de Triomphe, but this race is right up there. It's got global recognition. In its second year it has become one of the biggest races in the world." Magnier has brought in the three-year-old American-bred US Navy Flag, which is trained at Ballydoyle by genius trainer Aidan O'Brien. US Navy Flag was the first horse in 35 years to win both the Middle Park Stakes and the Dewhurst Stakes in the UK. O'Brien has previously described him as "a tough, hardy horse. A very exciting horse really." Magnier said it was always the plan to bring the stud's best horses to Australia for The Everest. "Last year we tried to send Caravaggio but there was a problem," he said. "This is the race we want to send our fastest horses. When US Navy Flag won in Newmarket in July, we were delighted. We always wanted to send him but that win guaranteed his place." He hopes US Navy Flag and Ryan will do for The Everest what Irish-trained Vintage Crop did for the Melbourne Cup in 1993. Vintage Crop's Cup-winning trainer Dermot Weld has said the horse "was a pioneer for the internationalisation of the Melbourne Cup, which wasn't well known around the world at the time". For The Everest, Magnier said: "We are bringing an international flavour this year but I think that is just the beginning. "The excitement and buzz around the richest race on turf in the world means it is only going to get bigger," he said. "We have travelled a long way to take the fastest sprinters in Australia to Europe - now we want to bring them the other way. "There will be a lot more people coming down to the Everest from the US and Europe in the future." And Magnier said the appeal of The Everest, with its $13m in prizemoney, is attracting interest from people outside of racing. Three-quarters of the 33,000 people who attended last year's race were aged under 35 and had never been to Royal Randwick. "I have friends in Sydney who are not in racing and they don't know anything about the sport but they are coming to the Everest. It is putting racing on the front page of the paper," he said. "It is a fantastic concept." Magnier said buying the slot in the race was a great investment for his Coolmore Stud operation - with a bit of luck. "We bought the slot for $600,000 a year. We ran Tulip last year and she was fifth," he said. "The prizemoney has been changed this year. It's a good investment if your horse runs well. Hopefully we get a bit of luck on the day."